After the sensational hit of the second edition, rock on is back with a bang! All you talent & inspiring musicians and artists, looking for a platform showcase their talents on the centre stage. Rock On is the place to be! The contest is divided into three categories Fusion/Rock/Pop. The prelims happen on the 8th, 9th & 10th of Feb'19 and the grand finale is on the 19th of Feb'19. The event will be judged by well known legends from the music industry. Don't miss this opportunity to be the next superstar! Register now. Tuesday, 6 th Feb 2019. To register online visit www.forummalls.in/forumrockon or register offline at the helpdesk/information desk at any Forum Mall by filling the registration forms and dropping your CD/Pen Drive with your audition video. No. Requests for registration will not be entertained post closure of registration date i.e 6 th Feb 2019. 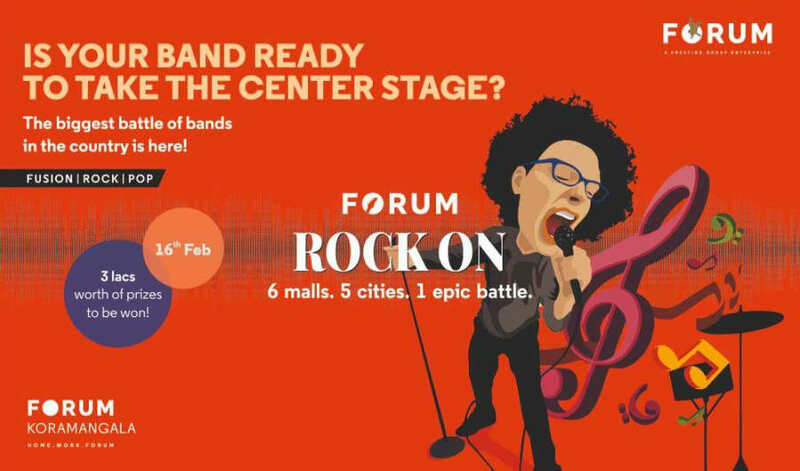 Participants must be at least of 16 years of age to be eligible for Forum Rock On. There is no maximum age limit. Parental consent is mandatory for participants below the age of 18. Every participant registering online will receive participation confirmation via an e-mail. Every participant registering at the Information Desk in the mall will receive a receipt. No. Requests for change in genre will not be entertained post registration. 1. A band is defined as any number of people. The minimum members of the band must be 2 and maximum members per band is limited to 8. 2. Only band members listed on the registration form will be admitted on stage. 4. On the day of performance, band members must be dressed in clothing free from obscenities. This is a family oriented event and therefore only activities suitable for families will be permitted. 5. Band name and lyrics of performance songs should not contain any obscenities if possible. 6. Judges can deduct points for any use of obscenities not necessary. 7. The entire performance must be violence-free and suitable for families. 8. If a band incites moshing or any other sort of violence in the crowd, the band will be immediately disqualified and the performance will be stopped. 9. The use of any illegal substances will not be tolerated. If any band member is suspected to be under the influence of an illegal substance, the entire band will be disqualified and the proper authorities will be notified. In addition, any band member under the age of 21 who is suspected of alcohol use will also be grounds for disqualification. 10. All band members are required to be present at least 30 minutes prior to performance time to check in with the coordinator. If all band members are not present and ready to setup for performance 15 minutes before going on stage, the band will be disqualified. 13. Band members are responsible for the security of their equipment. 14. Each band will be given the opportunity to play 3 songs. 15. All songs must be original or cover songs or songs by other artists. its songs accordingly and no more than 10 minutes is allowed for all the 3 songs. 17. Each band will be given 10 minutes to set up and 5 minutes to break down their equipment. 18. Bands may not use pre-recorded sound material. All bands must play live.